I set an alarm for 6:30 am. We were up and moving pretty quickly. We had breakfast in the restaurant (pancakes!). We were on the road to the Yosemite Valley a little after 8:00 am. It was about a 35 minute drive from the hotel into the valley. 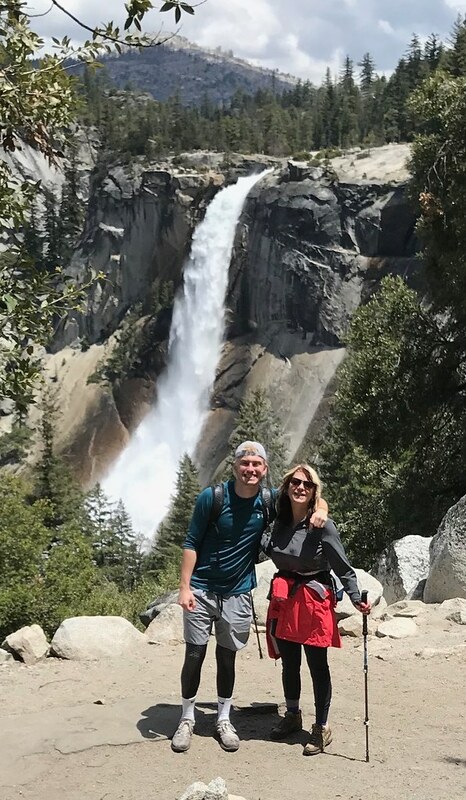 The plan for the day was to hike to Nevada Falls. Parking in the Curry Village Parking lot, we were on the trail about 9:10 am. 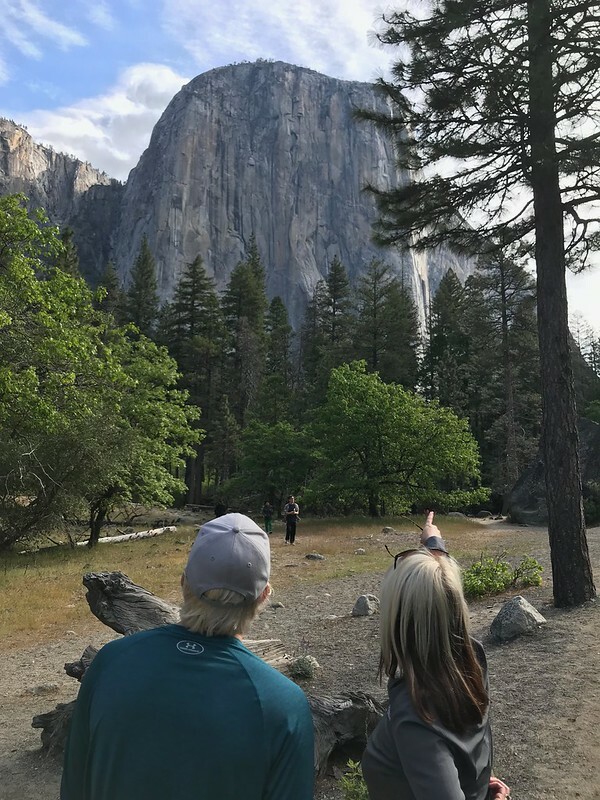 Sharon and I hiked this trail in August of 1997 when she was training for the Half Dome hike. We also hiked the first mile or so with Drew and Morgan; my best guess was that this was May or June of 1997. On the way up, we hiked the Mist Trail. The section below Vernal Falls was very wet. After some debate about continuing to Little Yosemite Valley, we stopped and had lunch at the top of Nevada Falls. Jack and I both would have liked to go a little further. After lunch, we hiked down the John Muir Trail. In total, we covered about 9.5 miles in just over five hours. A map of the hike is here. Given that it has been twenty years since I did this hike, I was surprised by a couple of things. 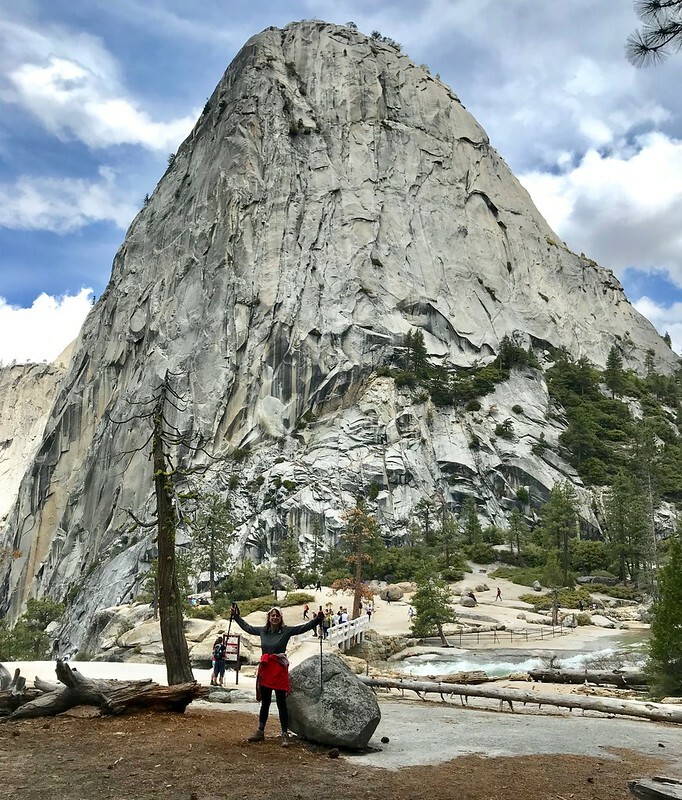 When we did the hike before, we went up the John Muir Trail and down the Mist Trail. I had forgotten how steep the sections just below both Vernal and Nevada Falls are. For some reason, I remembered the steel staircase as being at Nevada Falls rather than Vernal Falls. Finally, I remembered the exposed section on the John Muir Trail as further down from Nevada Falls. As we got back to the car, it was amazing how many people were on the lower section of the trail. Additionally, there were lots of cars circling the parking lot looking for a spot. Once we got packed up, Sharon wanted to head to the Ahwahnee Hotel for an adult beverage. There were people everywhere. I circled the lot while Sharon went in to get a table. I eventually tried to get the car valeted parked, but they would only take hotel guests. We eventually gave up and headed back to the Rush Creek Lodge. After getting cleaned up, we went to a beer tasting that the lodge was holding. They poured a selection of California beers. In addition to the three of us, there was a family from England. We had dinner again in the Tavern. I had a Greek Salad and a Mushroom Flatbread, while Sharon and Jack both had burgers.